* With more than 80 essential masterworks arranged for easy piano, this book guarantees a lifetime of exploration and enjoyment at the keys. * Titles: 1812 Overture (Tchaikovsky), Air on the G String (Bach), Andaluza No. 5 (Granados), Anvil Chorus (Verdi), Ave Maria (Bach-Gounod), Ballade No. 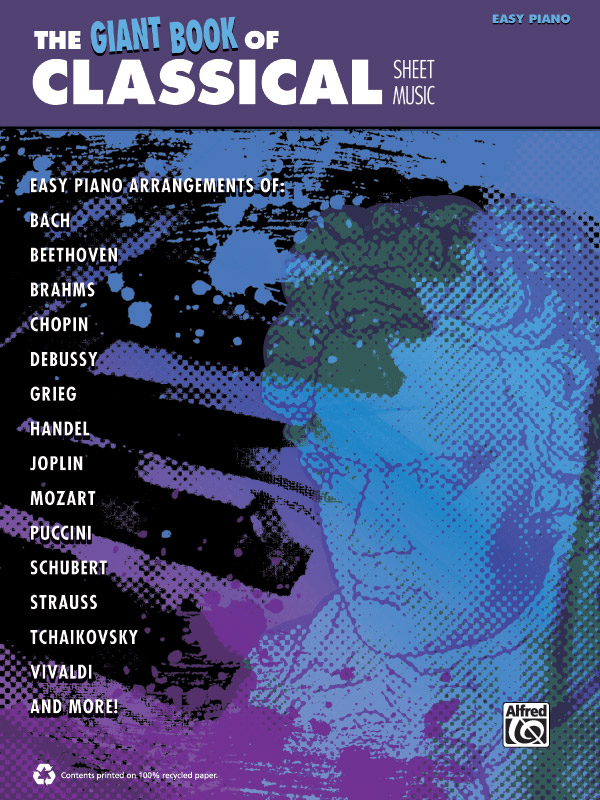 1 (Chopin), Barcarolle from Tales of Hoffmann (Offenbach), The Blue Danube (Strauss), Brandenburg Concerto No. 3 (Bach), Bridal Chorus, from Lohengrin (Wagner), Can-Can (Offenbach), Canon in D (Pachelbel), Clair de lune (Debussy), Doretta's Song (Puccini), The Entertainer (Joplin), Egmont Overture (Beethoven), Eine kleine Nachtmusik (Mozart), "Emperor" Concerto (Beethoven), Fantaisie-Impromptu (Chopin), Flower Duet (Delibes), Funeral March of a Marionette (Gounod), The Garland Waltz, from Sleeping Beauty (Tchaikovsky), Habanera (Bizet), Hallelujah Chorus (Handel), Hornpipe (Handel), Hungarian Dance No. 5 (Brahms), Intermezzo (Mascagni), In the Hall of the Mountain King (Grieg), Jesu, Joy of Man's Desiring (Bach), L'Arlésienne Suite No. 1 (Bizet), Là ci darem la mano (Mozart), La donna è mobile (Verdi), Libiamo, from La Traviata (Verdi), Mandolin Concerto in C Major (Vivaldi), Maple Leaf Rag (Joplin), March from The Nutcracker (Tchaikovsky), March of the Toreadors (Bizet), Meditation, from Thaïs (Massenet), "Merry Widow" Waltz (Lehár), "Military" Polonaise (Chopin), "Minute" Waltz (Chopin), The Moldau (Smetana), "Moonlight" Sonata (Beethoven), Morning Mood (Grieg), Musetta's Waltz (Puccini), "New World" Symphony (Dvorak), Nocturne, Op. 55, No. 1 (Chopin), O mio babbino caro (Puccini), Ode to Joy (Beethoven), Overture from The Marriage of Figaro (Mozart), "Pathétique" Sonata (Beethoven), Pavane (Fauré), Piano Concerto No. 1 (Tchaikovsky), Piano Sonata No. 11 (Mozart), Polovetsian Dance (Borodin), Pomp and Circumstance (Elgar), Prelude from Cello Suite No. 1 (Bach), Prelude, Op. 28, No. 4 (Chopin), Prince of Denmark's March (Clarke), Queen of the Night Aria (Mozart), "Raindrop" Prelude (Chopin), "Revolutionary" Etude (Chopin), Rondeau from Suite de symphonies (Mouret), Rondo alla Turca (Mozart), Sheep May Safely Graze (Bach), Solace (Joplin), The Sorcerer's Apprentice (Dukas), Spring, from The Four Seasons (Vivaldi), Ständchen (Schubert), "Surprise" Symphony (Haydn), The Swan (Saint-Saëns), Swan Lake, Act I Finale (Tchaikovsky), Symphony No. 5 (Beethoven), Symphony No. 40 (Mozart), Toccata in D Minor (Bach), Toreador Song (Bizet), Turkish March (Beethoven), Un bel dì (Puccini), "Unfinished" Symphony (Schubert), Variations on "Ah, vous dirai-je, Maman" (Mozart), Voi, che sapete (Mozart), Waltz, Op. 39, No. 15 (Brahms), Wedding March from A Midsummer Night's Dream (Mendelssohn).